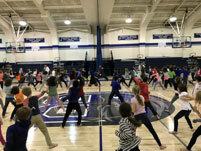 Hong Ik Martial Arts Masters and SUSA had the exciting opportunity to visit public schools in lower Westchester County and introduce them to the Korean New Year and Taekwondo. The Korean New Year, called “Seol”, is the most important holiday of the year throughout Korea. Korea follows the lunar calendar. Unlike the 365-day solar calendar, the lunar calendar tracks the cycles of the moon (29.5 days per month). It is therefore shorter and lasts only 354 days. For this reason, the lunar and solar calendars always fall on different days. The observance of Seol is very sacred and is a national holiday. Families gather together starting early in the morning to express their gratitude towards both Mother Nature and to their ancestors. Organic food is prepared and served on ceremonial tables. Descendants first face their ancestors and perform two full traditional bows. The descendants then turn around to face their children standing behind them, and the children proceed to perform one traditional bow to their parents. Throughout the rest of the day, children go to visit the homes of older relatives and greet them with one traditional bow. The purpose of the full bow is to connect spiritual energy amongst each other. Furthermore, traditional Korean culture has the belief that connection of spiritual energy can also extend to the souls of our ancestors. Some popular Seol customs include Kite flying as well as “Neol Dwi Gi” and “Pang Yi Chi Gi”. The Kite flying custom entails flying a kite to its highest peak, and then cutting it loose so that it rises even further into the sky. It is a form of revering heavenly God. Another game is called Neol Dwi Gi which issimilar to seesaw game in western culture. Kids stand at opposite end of a plank and emphasis is on teamwork, helping propel your fellow up as high as possible with a hope that their brain (home of their spiritual energy) reaches closer to heaven and enlightenment. It is another form of revering heavenly God. Lastly, Pang Yi Chi Gi involves winding up a top with a string and continuing to spin it with enduring effort by hitting it with a leather strap to keep the top from falling over. This symbolizes carrying one’s sincere efforts well into the New Year without quitting, ensuring growth and avoiding collapse. Taekwondo is an essential component of Korean culture. 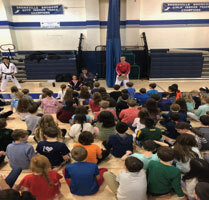 We were honored to introduce aspects of both Taekwondo and Seol to school children, allowing them to experience firsthand a taste of Korea and its traditional origins.